FIIs are on a buying spree. Their total net buying was worth a massive Rs 148.2 Billion during the week. DIIs were net sellers on all five trading days. Their total net selling was worth Rs 74.0 Billion, as per provisional figures. India’s WPI based inflation rose to 2.93% in Feb ’19 from 2.76% in Jan ’19, due to rise in food prices. WPI based inflation was 2.74% in Feb ’18. India’s trade deficit narrowed to US $9.6 Billion in Feb ’19 from US $14.73 Billion in Jan ’19. Merchandise exports grew 2.44% YoY to US $26.67 Billion while imports were down 5.41% to US $36.26 Billion. The daily bar chart pattern of Sensex broke out above the Fibonacci resistance zone (refer last week’s post) on Mon. Mar 11, and continued to soar higher as a flood of FII inflow fuelled a sharp rally. The entire trading since the low of 33292 touched on Oct 26 ’18 has formed a wide upward-sloping channel. The index faced resistance from the upper edge of the channel on Fri. Mar 15. Daily technical indicators are looking bullish and overbought. MACD is rising above its signal line in bullish zone. ROC, RSI and Slow stochastic are well inside their respective overbought zones. All three EMAs are rising, and the index is trading well above them in a bull market. However, overbought technical indicators are hinting at a pullback – towards the ‘gap’ zone (between 37106 and 37231) formed on Tue. Mar 12. If FIIs continue buying, expect the index to move higher and test the previous (lifetime) top of 38990 touched on Aug 29 ’18. Some correction from the current level will improve the technical ‘health’ of the chart, enabling those who missed out on the rally to enter. But corrections won’t occur just because we want them to. FIIs appear convinced that NDA will return to office for a second term. They have turned the stock market into a ‘voting machine’ and may be ‘buying the rumour’ only to ‘sell on news’. The weekly bar chart pattern of Nifty closed convincingly above the Fibonacci resistance zone (refer last week’s post) on the back of strong buying by FIIs. It was the fourth straight week of higher close for the index. The entire trading since the Oct ’18 low of 10004.55 has formed a wide upward-sloping channel, which will remain in force till it gets breached. The index is facing resistance from the upper edge of the channel, and can pullback towards 11120. Weekly technical indicators are looking bullish and overbought. 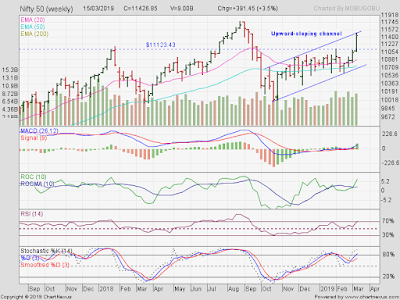 MACD is rising above its signal line in bullish zone. ROC has crossed above its 10 week MA to enter overbought zone. 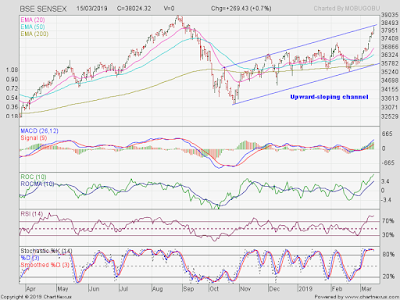 RSI is poised to enter its overbought zone. Slow stochastic has re-entered its overbought zone, but is showing negative divergence by failing to rise higher with the index. Nifty’s TTM P/E has moved up to 28.01, which is well above its long-term average in overbought zone. The breadth indicator NSE TRIN (not shown) is moving down in neutral zone. Some more near-term index upside is possible. Bottomline? Sensex and Nifty charts have broken out above their respective Fibonacci resistance zones. Both indices are trading within upward-sloping trading channels, and can be expected to move higher on the back of FII buying. Dips can be used to enter.